As the only artificial humanoid of his kind in operation, Data is a unique being, a triumph of engineering in spite of his singular nature, the android is driven by his own needs and desires to go beyond the mere act of existing, and strive for greater things, and strive for greater things. As a highly extraordinary and unique being, Data has managed a catalogue of triumphs over the myriad challenges set before him. The incredible capabilities of Data`s android mind and mechanical body are a testament to the skill of his creator. The extraordinary high computing power of his positronic brain - a device with a storage capacity of 800 quadrillion bits, and a functioning processor speed of 16 trillion operations per second - means that his outward emulation of human form and function are close to perfection than any other mechanism ever built by human hands. He sometimes lacks basic comprehension of certain humanistic traits and elements, but the ability of Data`s eidetic memory to remember every fact he is exposed to, combined with an unmatched insight from the incorporated memories of 411 colonists from the Omicron Theta colony, means that his deductive reasoning is fast, intuitive, and highly intelligent. In the course of his many duties as a science officer aboard the U.S.S. Enterprise NCC-1701-D and later NCC-1701-E, Data has observed and discovered hundreds of unique scientific phenomena forever enriching the Federation`s knowledge of the Universe. Data has distinguished himself time and time again in service to Starfleet. His record shows an impressive array of awards and medals including decorations for honour, commendations for gallantry, the STAR FLEET MEDAL OF HONOUR (WITH CLUSTERS) and the LEGION OF HONOUR. 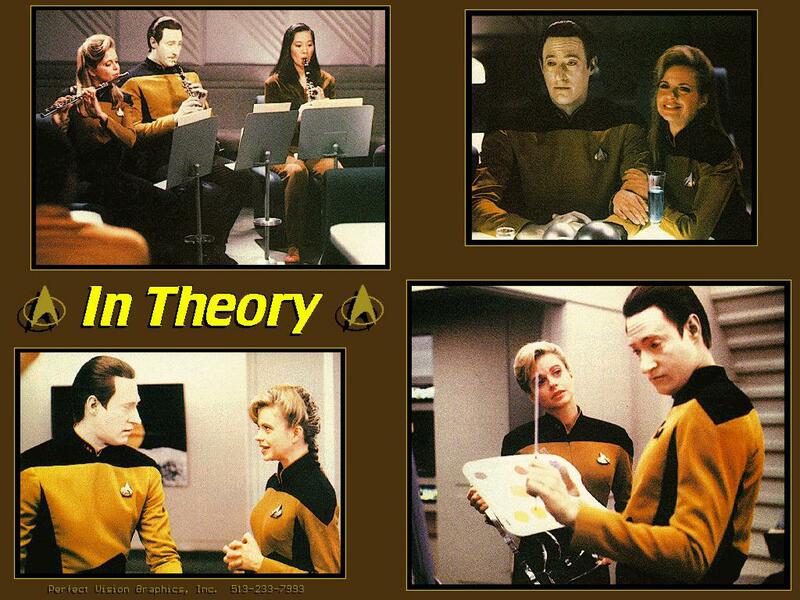 In 2368, Data`s expertise is tested during his temporary promotion to command the U.S.S. Sutherland NCC-72015, as part of a flotilla under the control of Captain Picard. Challenged by the Sutherland`s acting first officer Lt Commander CHRISTOPHER HOBSON the android rises to the occasion and demonstrates a talent for starship tactical strategy and command. Data`s early life is often characterised by his inability to emulate even the simplest of human emotional states - and yet he still develops close, personal relationships with his colleagues aboard the Enterprise. Data`s ability to comprehend emotions is greatly enhanced by the brief but poignant life cycle of his android "daughter" Lal, Data emulates organic beings` desire to reproduce by creating an offspring, and also matches the triumphs of his creator Dr Noonien Soong, the android constructs Lal from scratch, using new SUB MICRON MATRIX TRANSFER technology in order to duplicate his own neural pathways in her positronic brain. A cascade failure within Lal`s neural network causes her death, but Data transfers her stored memories - including those of apparent emotional responses - back into his own mind. The android finally triumphs over his inability to feel emotion in 2371, when he installs an emotion chip made by his creator Dr Soong into his positronic brain. This is the boldest step of his life, allowing him to finally embrace human traits. Without a doubt, the greatest triumph of the android`s life thus far is the simple fact that he exists, Data outlives his erstwhile and idiocyncratic creator, taking his existence to new levels, and continuing to assimilate the ever-changing nature of the human condition. Indeed, hisexistence has had effects that resonate far beyond the android`s immmediate world. After his rescue by the crew of the U.S.S. Tripoli, from the devastated Omicron Theta, Data expresses a desire to enter Starfleet Academy, something that no artificial life had ever done before. The Academy entrance committee validated Data`s claim and allowed him to train for Starfleet. he was inducted into the service in 2341, setting a precedent for any artificial beings that might come after him, the committee`s decision was not, however classed as defintive with regard to his status as a living being, and his claim to the same civil rights guarenteed to organic life forms. As such, the question of Data`s sentience is deliberated in a tribunal in 2365, when Commander bruce Maddox attempts to assume control of the android`s life for his won research. Thanks the an impassioned speech by Data and Captain Picard, presiding officer Captain Phillipa Louvois rules that Data is a sentient being, and therefore entitled to all civil rights granted by the constitution of the United federation of Planets. Like all sentient beings, Data is forever in search of his own truths and ultimate potential - and as a Starfleet officer, his sworn mission to seek out new life is as much anexploration of himself as it is of the Universe.